The Look 4 Less: Ebates - Get $$ for shopping online! 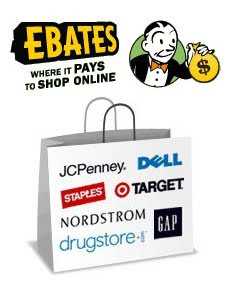 Ebates - Get $$ for shopping online! Doing any Christmas shopping online today? You should check out Ebates if you don't have it already - I love this site!! I've posted about Ebates before (see previous post here) but I thought I'd do another quick post for those that might be new to the site and have yet to hear about this great (FREE) service! Ebates is the pioneer and leader of online Cash Back Shopping. The company was founded in 1998 by two Deputy District Attorneys in Silicon Valley who used to prosecute online fraud & identity theft before starting Ebates (so you can be sure we are very into secure online transactions!). So go ahead, sign up and start shopping now. Joining Ebates is always free - you'll never pay us anything. And four times a year or more, we'll mail you a Big Fat Check, or transfer the money to your PayPal account if you'd prefer. We can even send the money to your favorite charity. All 100% free. People often ask: "This sounds too good to be true, how are you able to do it?" It really is quite simple. Just like almost every other online shopping center, we get a commission from the stores when you make a purchase. Instead of keeping that money - like almost all other sites do - we share it with you! So, as long as 900+ of the world's top online stores are happy to pay a bonus to attract the new, valuable customers we send their way, Ebates is going to continue to send Big Fat Checks to our satisfied customers across the globe. Click here to see more FAQs. I always check Ebates before I buy anything online and I've gotten a decent amount of cash back over the years (I've been using this service since 2005). Every store is different, and they offer double cash back for certain stores that rotate every week. They cut checks 4 times a year which you can have sent to you directly or deposited in your paypal account (or donated to a charity of your choice). The store selection is great as well, they have everything from Target to J Crew, Nordstrom to Sephora. If you click HERE to sign up you'll get a $10 bonus, and I'll get $$ in my account too when you become a qualified member (just spend $25 minimum after using the link prior to December 31st! ).